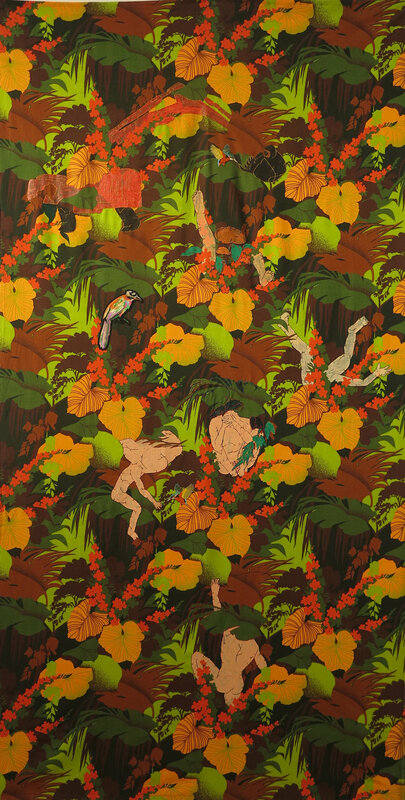 At-Home Day, 2009, embroidery and painting on fabric, 62 x 62 cm. 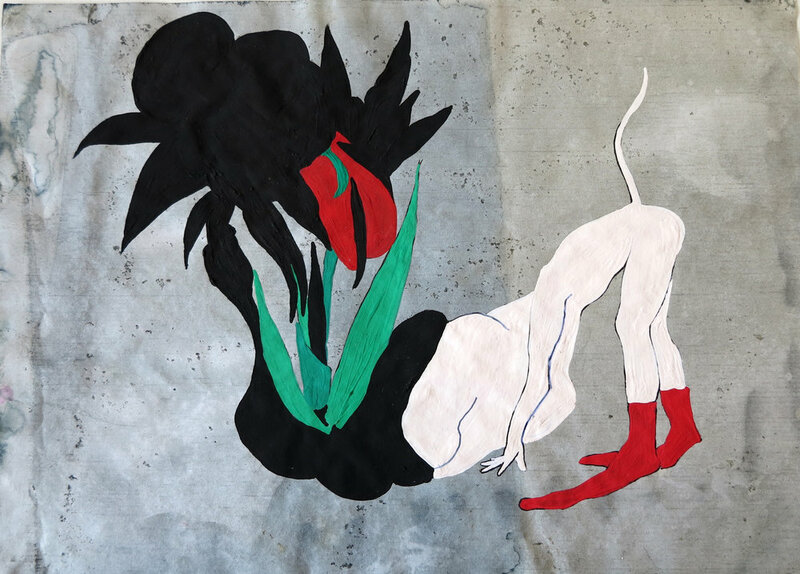 The Deficient Joint Gap, 2017, embroidery and painting on table cover, 119 x 130 cm. Installation shot, 15th Istanbul Biennial, Pera Museum, 2017. 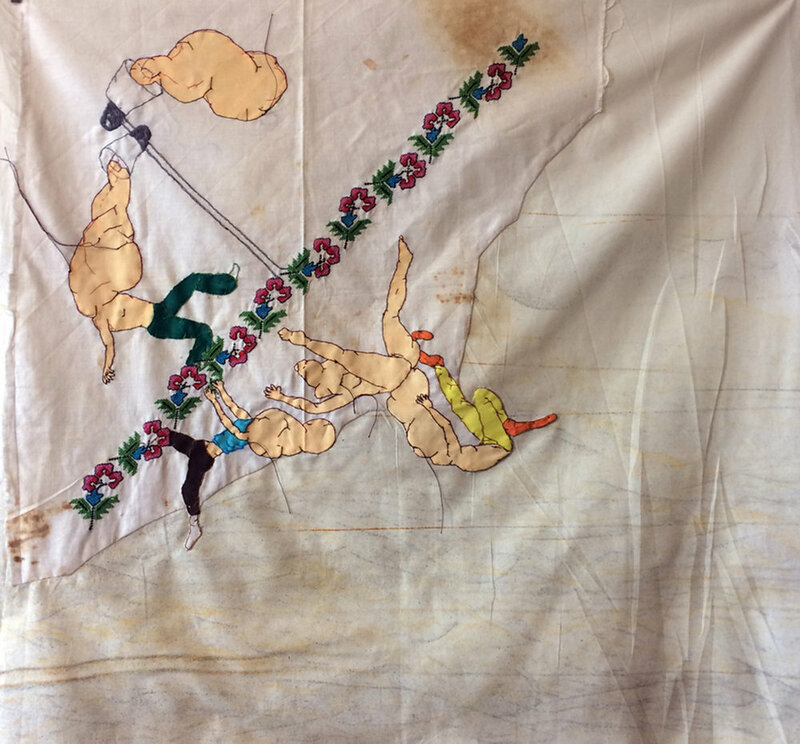 Boys Eat Turkish Delight, 2010, embroidery and painting on a curtain, 34 x 25 cm. 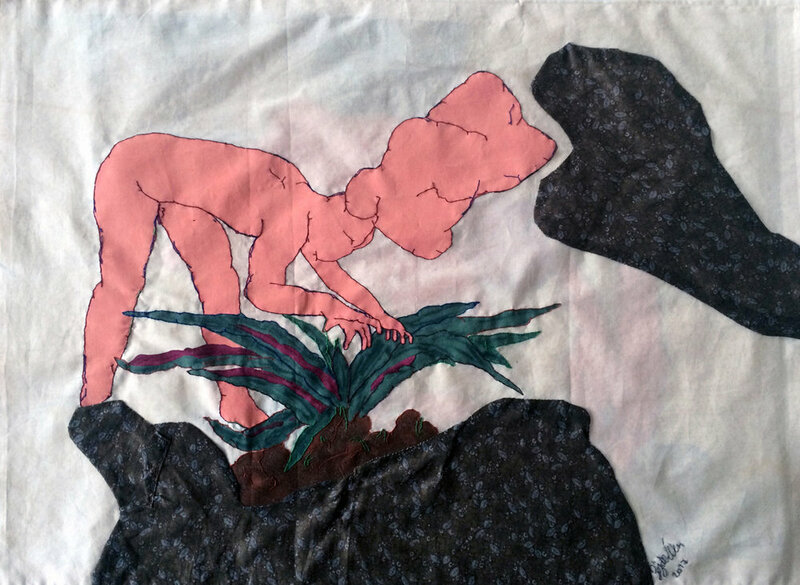 Pediment: Tempetare, Resentful, Nolens Volens, 2017, embroidery and painting on bundle fabric, 71 x 67 cm. 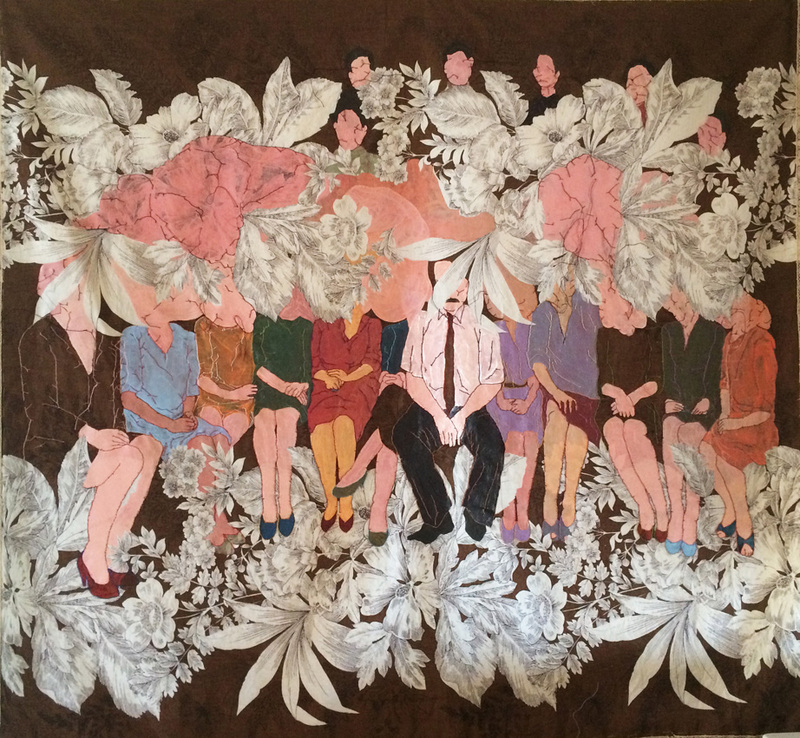 Diplomacy, 2014, embroidery and painting on fabric, 147 x 206 cm. Visitors –V, 2017, Stitching - painting and patchwork on found fabric, 54 x 74 cm. 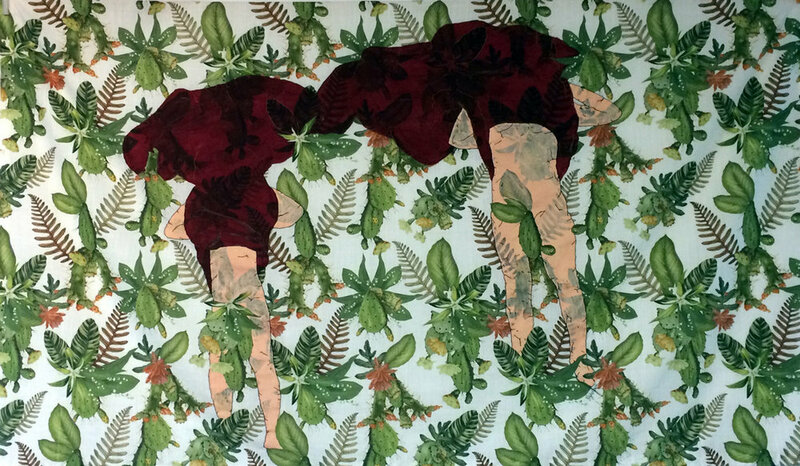 Perfect Match, 2018, Stitching on found fabric, 88 x 148 cm. Bird Talks, 2018, Stitching - painting and applique on found fabric, 112 x 222 cm. Stady in Storm, 2018, Stitching - painting and patchwork on found fabric, 57 x 39 cm. Impulse, 2018, Stitching - painting on and patchwork on vintage fabric, 76 x 74 cm. Local Stranger, 2018, Stitching - painting and patchwork on found fabric, 79 x 75 cm. Remote Possibility, 2018, Stitching - painting and patchwork on found fabric, 68 x 73 cm. Visitor, 2017, Stitching - painting and patchwork on found fabric, 57 x 77 cm. #23 (Nook Series), 2018, Drawing series on natural-dyed paper, 30 x 21 cm. #25 (Nook Series), 2018, Drawing series on natural-dyed paper, 30 x 21 cm. #27 (Nook Series), 2018, Drawing series on natural-dyed paper, 30 x 21 cm. #41 (Nook Series), 2018, Drawing series on natural-dyed paper, 30 x 21 cm. #37 (Nook Series), 2018, Drawing series on natural-dyed paper, 30 x 21 cm. #34 (Nook Series), 2018, Drawing series on natural-dyed paper, 30 x 21 cm.